HomeAward Winning Photographer Will Give Gallery Talk at the Berkeley Art Works. Award Winning Photographer Will Give Gallery Talk at the Berkeley Art Works. 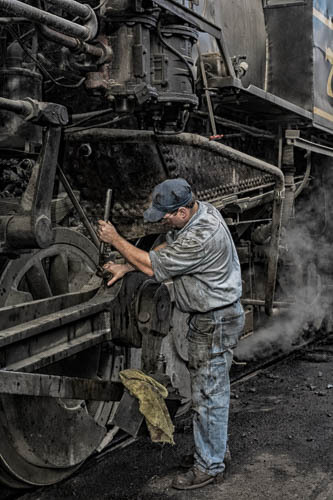 On Saturday September 17 at 3:30pm, award-winning photographer Joe Goodrich will give a gallery talk about his adventures and “mis-adventures” chasing and photographing trains. Joe’s image “Man and Machine” received a Merit Award in the “Heavy Metal” juried exhibit at the Berkeley Art Works. The gallery is located at 116 North Queen Street in Martinsburg. 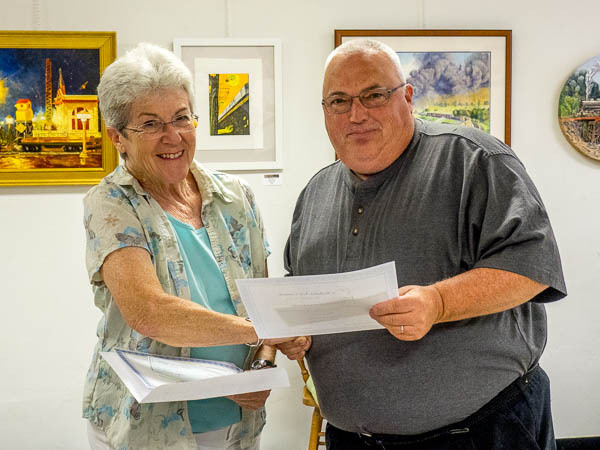 Arts Council President Malinda Shaver presents Merit Award to Joe Goodrich at the “Heavy Metal” reception on September 9. Joe is president of the Antietam Photographic Society and has a long history of railroad involvement and photography. Join us for an entertaining hour at the Berkeley Art Works, 116 North Queen Street in Martinsburg. Saturday September 17 at 3:30pm.